This elder has almost black foliage with scented blooms that are a beautiful creamy pink. For best foliage colour grow in full sun otherwise the leaves can fade into a greenish-bronze. Height 300cm. Supplied in a 7.5-10 litre pot. 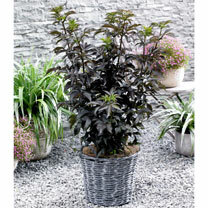 This elder has almost black foliage with scented blooms that are a beautiful creamy pink. For best foliage colour grow in full sun otherwise the leaves can fade into a greenish-bronze. Height 300cm. Supplied in a 3 litre pot or 7.5-10 litre pot. Humus rich, moist, well drained soil. Ideal for beds and borders, patio pots and containers. Attractive to butterflies and bees. Prefers full sun or partial shade.